Is something standing in the way of your fitness progress? 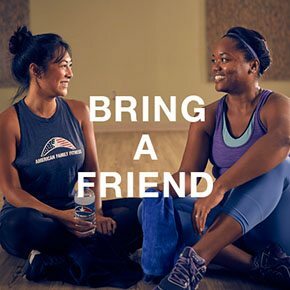 At American Family Fitness, we provide members with group classes that bring the motivation and energy you need to create a healthier lifestyle. Group fitness classes at our health club offer experienced instructors, energizing music, amped-up exercise, and a motivating group atmosphere to boost you to a new level of fitness. You'll find everything from Zumba, Power, Tabata, Step and Fight, and cycling -- to hot yoga and barre. All you need is a water bottle, a towel to wipe your sweat, and a can-do attitude. Bring it! Does a group atmosphere revitalize you? With group fitness classes at our gym in Glen Allen, you can shed pounds and increase muscle while having fun. With our knowledgeable instructors, motivating music, and creative exercise routines, you won’t even realize you’re exercising. We know everyone has busy schedules, and so we offer group fitness classes throughout the day, all week long. Classes at our Glen Allen health club include strength training, cardio, mind/body workouts (like hot yoga), and dance exercise such as Zumba. Want more? There's Power, Tabata, Step and Fight, and cycling too! 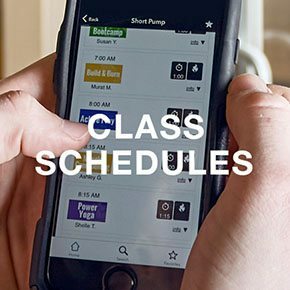 Visit our Class Schedule page to decide what works best for you.